EGLIN AIR FORCE BASE, Fla. -- A major step in the building the Air Force's F-35A Lightning II training program was accomplished when the 33rd Fighter Wing completed the training and flying portion of the service's operational utility evaluation on schedule Nov. 15. Four pilots began training when the evaluation started Sept. 10, expecting it to last approximately 65 days. Six weeks of academic training and 24 sorties later, they are all fully-qualified F-35A pilots. "We were able to conduct the flying portion in less than half the time than we planned for because things went so well with the flying, weather was good, maintainers were doing a great job getting jets out on the line and instructors were doing a good job of teaching these guys," said Col. Andrew Toth, 33rd Fighter Wing commander. From no experience to fully qualified joint strike fighter pilot was the hallmark of the success according to wing leaders and instructor pilots. Lt. Col. Eric Smith, 58th Fighter Squadron director of operations and first Air Force F-35 instructor pilot, recalled leading one of four OUE students, Maj. Joseph Scholtz, during an Instrument qualification course Nov. 9. "Four weeks before the first pilot qualified, he was an A-10 pilot at Nellis Air Force Base (Nev.) and hadn't been involved much in the F-35 program other than what he read in the news about what was going on," said Smith. "The 33rd Fighter Wing testament to all of the hard work that has been going on here the last three and a half years of standing this place up, getting ready to train pilots, was when we took him out today and he pretty much flew a flawless F-35 mission. It's also a testament to Lockheed Martin partners involved in helping the Nomads, the men and women of 33rd, build a training system down here, develop it and go out and execute it." During the flying portion, students demonstrated their ability to take off into restricted airspace, train flying in formation while airborne, conduct instrument approaches at a neighboring military base and clear the traffic pattern to land at Eglin. Their "check ride" was an hour-long flight culminating in full qualification to fly the F-35. 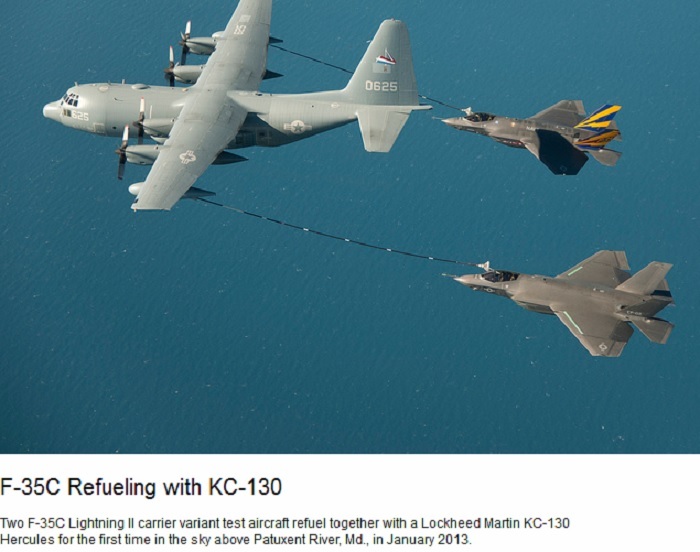 "Maintainers have done a fantastic job of generating sorties," Smith said. The OUE provided the setting to test the 135 trained maintainers in generating up to six flights a day utilizing nine F-35As. "Maintenance really stepped up to the plate," said Tech. Sgt. Matthew Burch. "They are learning the fifth generation way of maintenance quickly." As they go along in their daily routine, maintainers find themselves rewriting joint technical data to pave the way for the future "play book" of maintaining F-35As alongside their contract logistics partners. 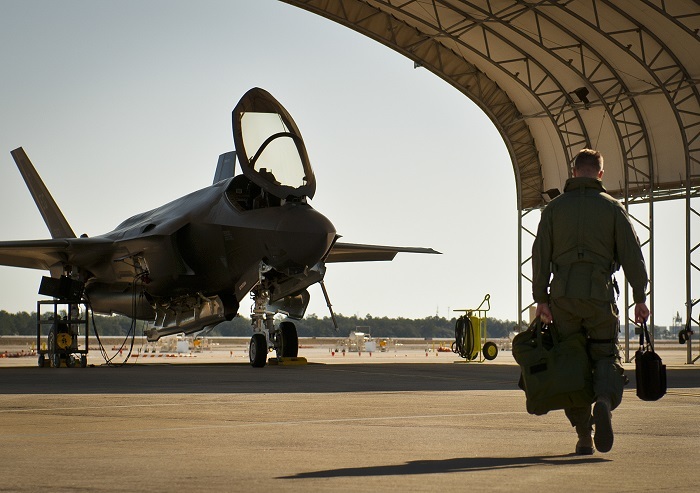 "Training conducted here at Eglin then enables the rest of the Air Force organizations to start standing up too, begin their training and test and evaluation piece - big steps in the F-35 program," said Toth. Scholtz will give feedback, as others going through training do, before going back to his unit at Nellis, the 59th Test and Evaluation Squadron where the joint strike fighter will arrive next year. The other qualified F-35A pilots trained during the OUE were Lt. Col. Brian O'Neill of Edwards Air Force Base, Calif., and Majors Cougar Wilson and Scout Johnston from the 33rd FW. "A great part of all of this is the fantastic job of all the services. The OUE was a great couple of weeks flying, and we couldn't ask for any more," said Toth. "We are ready for the Joint Operational Test Team to write their report, provide us a quick-look out brief then formally brief our command on what they thought of the training system here. Once we receive the Air Education and Training Command's approval stating we are 'Ready For Training,' we can begin our first class." Smith and his team of instructors are ready to train six pilots early next year as soon as they get that notice. "We'll receive the training system for the block 1B operational flight program, the suite of software in the jets," he said. "It'll be our first class in this configuration. We are calling it a small group tryout, a contractual thing to make sure courseware developed is up to standards. It will take two months." After its first year of training, the wing expects to see "normalcy" in its program. 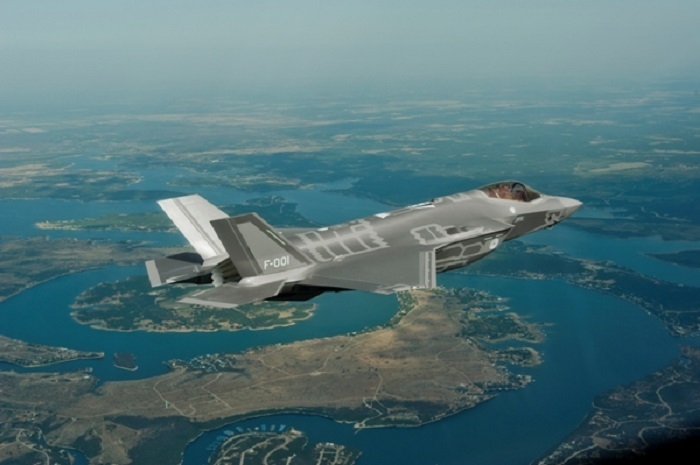 "Concurrency of testing and training in the Air Force F-35 program means basic training of operational test pilots will happen first at Eglin in the near term," said Toth. "The pilots will then follow-on to Nellis or Edwards to conduct testing on new F-35 systems and capabilities before the wing adapts them in the training environment, resulting in the growth of the program becoming much more normalized. Meanwhile, the game plan for other military services and international partners will continue. 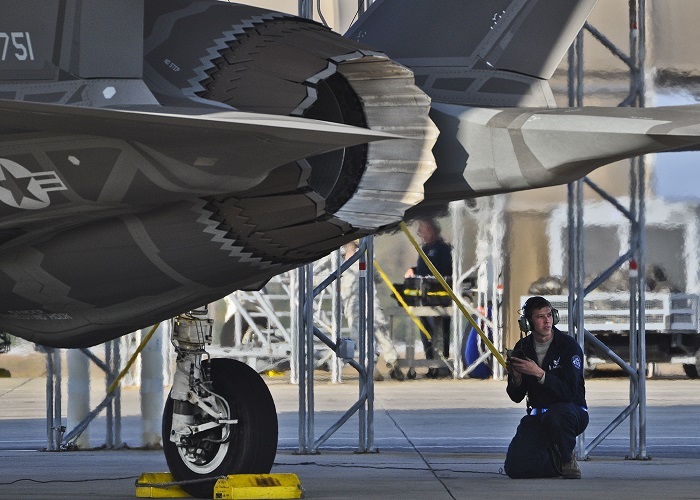 Eventually there will be 2,100 maintenance students and 100 U.S. military F-35 pilots a year." 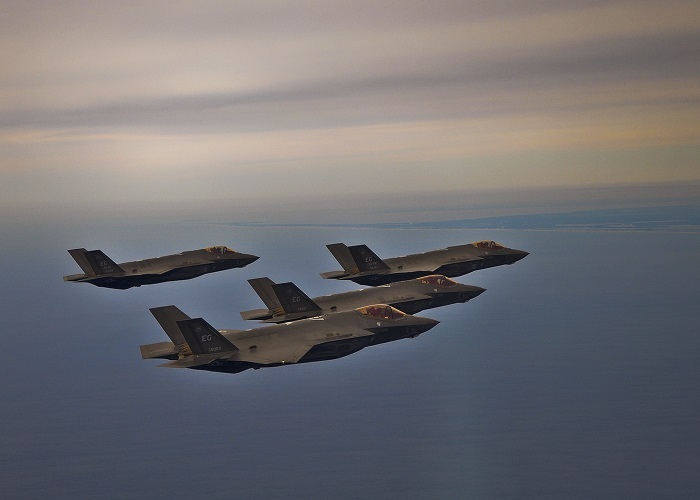 EGLIN AIR FORCE BASE, Fla. -- Increasing capability is becoming routine for the F-35 Lightning II team. The 58th Aircraft Maintenance Unit produced a four-turn-four for the 58th Fighter Squadron flying Jan 31. "The pilots flew four F-35As in the morning and the maintainers performed routine maintenance for airworthiness after landing. Then the crew chiefs 'turned' them around so the four jets could be flown in the afternoon," said Col. Andrew Toth, the commander of the 33d Fighter Wing and one of the aviators in the formation. That was the first F-35 four-turn-four at the wing. Following up the successful flights, the team did the same Feb. 1 with a four-turn-two. During the Jan. 31 training flights, the pilots were using their advanced radar systems to track F-16 "adversaries" over the Gulf of Mexico. 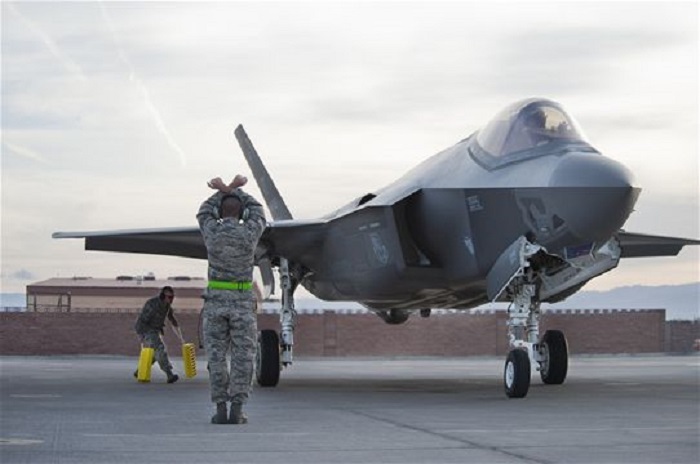 Additionally, the maintainers had spare F-35As ready to go in the event of any issues in flight proving their ability to prepare the Air Force's newest fighter jet for basic pilot training. While turning jets and flying multiple aircraft in formation is standard operations at an established flying training unit, for the 33d Fighter Wing, it was another step forward to self-sufficiency. Subsequently, it boosted morale. "It was good to pull that off last week knowing recent weather can cancel flights," said Senior Master Sgt. Eric Wheeler, the production superintendent with 58th AMU. "I can't control the weather...everything else I control. The jets took off without any issues, the pilots flew their scheduled times. They all landed safely and the aircraft downloaded correctly." 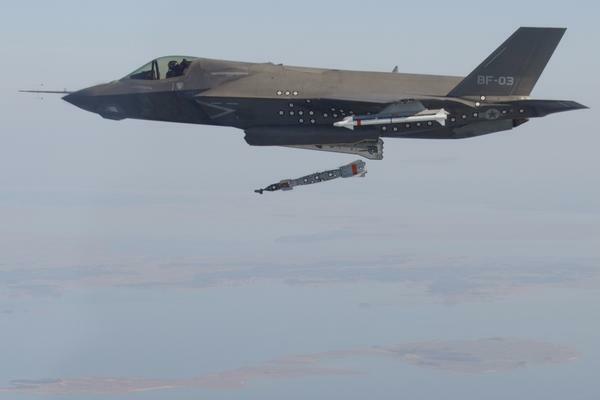 Unique to the JSF, the downloaded data is inputted into the autonomic logistics information system that tracks the health of the jet in a computer based diagnostics and logistics system. Contracted logistic support by Lockheed Martin is steadily giving way to 58th AMU crew chiefs as the Airmen become more proficient in maintaining the F-35A. LM will continue to support other variants and international partners. EGLIN AIR FORCE BASE, Fla., March 7, 2013 - Two officers from the operational test community are among the six pilots in the first F-35 Lightning II pilot training course after an Air Education and Training Command decision to start training here in January. EGLIN AIR FORCE BASE, Fla. -- Two officers from the operational test community are among the six pilots in the first F-35 Lightning II pilot training course after an Air Education and Training Command decision to start training here in January. Lt. Col. Benjamin Bishop, the 422nd Test and Evaluation Squadron director of operations, is one of the students who flew their first sortie in March. He will transition his F-15E Strike Eagle warfighting skills to the F-35 before he returns to Nellis Air Force Base, Nev., next month. "It's exciting, an honor to be a part of the future of airpower," he said. "The aircraft performed as I expected. It's a different feel and a different aircraft to get used to but both are easy to fly. Like any new aircraft, it's a different system to learn and I'm getting used to the basic maneuvers." "We will develop the tactics, techniques and procedures for the F-35 and how it fits in the bigger airpower picture for the U.S.," said Bishop about the work ahead of him after graduating here leading OT for the fifth generation aircraft. Like other students at the F-35 pilot training course in the 33rd Fighter Wing's Academic Training Center, Bishop began his temporary duty here with an orientation to the world of the joint strike fighter and custom fitting for the high-tech helmet. "I feel like I'm back," Bishop said during his first week at Eglin. "It's a smooth transition." "The academics section focused on the basic system of the aircraft and how it works - the hydraulics, electrical systems and avionics," said Bishop who had no exposure to the syllabus before coming to Eglin. The first half of F-35 pilot training courses remain in the classroom and virtual environment at the ATC until the pilots are ready to step to the aircraft for the first time. On the flightline, they are required to taxi the aircraft and fly six sorties before completing their training. Combined in-class and in-air time is approximately three months. Bishop's classmates, who are stationed at the 33rd FW, have been a part of the team building up the F-35 integrated training center and inevitably had more exposure to the syllabus before the first official class started. "The simulators are our real success story," said Lt. Col. William Betts, 33rd Operations Support Squadron commander who has been on the initial cadre team since 2009. "It's refreshing to hear others say it is just like flying the F-35 (once they complete the first flight)." "During my basic training in the F-15E back in 2000, the simulator was like a black and white T.V. screen hooked up to a cockpit," he said. "It shows how far we've come in (pilot) training. It's humbling for me to be around this world class environment." 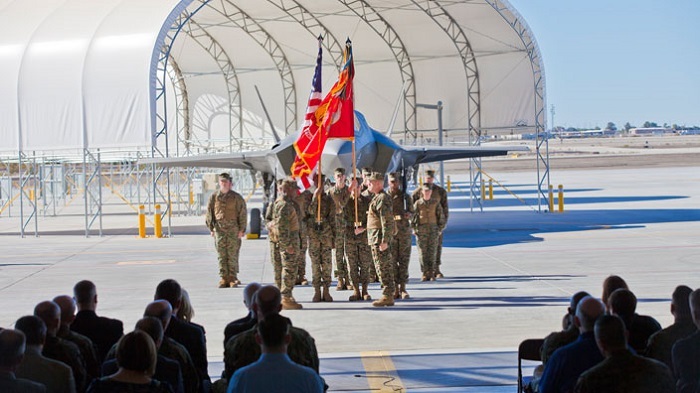 When Bishop returns to Nellis, he will hone those flight hours as a student and develop a plan for his squadron to begin demonstrating the F-35's combat capabilities as software becomes available. ACC's OT community has already paved the way for Bishop's team by standing up a unit at Edwards Air Force Base, Calif., where developmental test of the aircraft continues concurrently in the joint strike fighter program. He was able to greet three pilots from that unit in the ATC halls as they arrived in March to be a part of the second class. This pace should continue for the 33rd FW throughout 2013 with an estimate of 36 pilots graduating the course by the end of year. ACC was able to get in on the Air Force's acquisition life cycle early to build their expertise with the aircraft by sending operational test pilots through the first few courses at Eglin. As the Air Force's declaration authority for F-35A Initial Operational Capability, the command will make a decision based on achieving sufficient levels of readiness in both capability and capacity. Specific criteria established by the commander of ACC include the ability to conduct basic close air support, interdiction, and suppression/destruction of enemy air defense missions, with the targeting, payload, and other performance characteristics that entails. The 422nd is a geographically separated unit of the 53rd Wing, headquartered here.